Are you looking for an MMA diet plan or information on the optimal fighter’s diet? 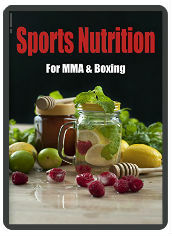 This free Sports Nutrition ebook / pdf has tonnes of useful information for aspiring UFC fighters and those looking to increase their recovery & performance. The ebook is completely free but please like my Facebook page for more MMA sports nutrition, techniques & news updates. Free ebook which contains a great deal of information on making weight, supplementation and ketogenic diets. Again, just to emphasise, it’s free! some of the effects of physical and mental stress on the body. they are worth considering as part of your nutritional regime. that this herb increases immune functioning and reduces fatigue. Also known as ‘Indian Ginseng’, this herb is a powerful antioxidant. suggesting that it will help enhance recovery. night time, it also results in crazy dreams! Date: 24 hours agoBrilliant book, Brilliant Information. Fantastic Book, at a great price – free!